Got Fish? Yes, and they are coming in droves. The alewife run up Bride Brook at Rocky Neck State Park in East Lyme is wrapping up for the season, and so far nearly 220,000 alewives (aka river herring) have made their way up the brook and into their spawning grounds at Bride Lake! That is nearly three times the pre-restoration average. 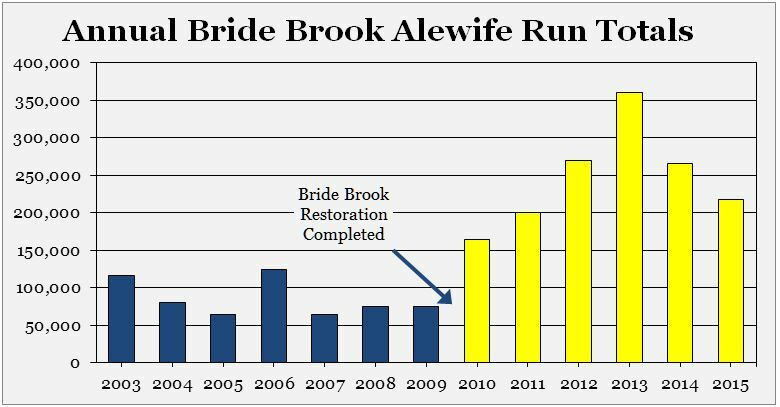 This year’s count continues Bride Brook’s strong numbers and further proves the success of our 2010 restoration project. If you like fish as much as we do, sign up for email alerts to know when to take action to protect their habitats and restore their numbers. Support for our work can go a long way toward improving the health and vitality of Long Island Sound’s fisheries. 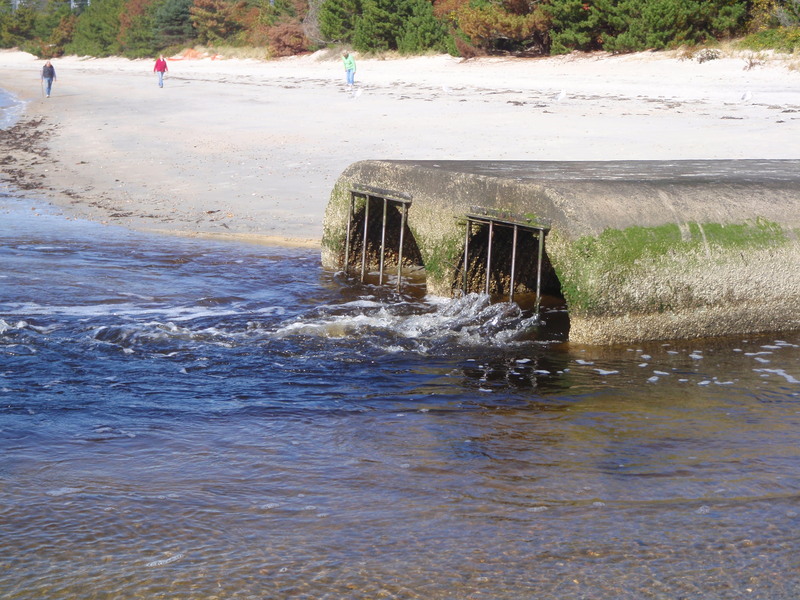 Since their construction in the late 1970s, two twenty-four-inch-wide culverts were Bride Brook’s only connection to Long Island Sound. The narrow openings restricted tidal flow to the marsh behind the beach, were susceptible to sand blockage, and endangered one of Connecticut’s historically best alewife runs. By the early 2000s, it was clear these culverts needed replacing. After thirty years, the metal culverts were corroded, becoming a public health hazard, and threatened outright collapse. Plant communities in the marsh, battling reduced salinity, struggled to survive and fight off invasives. And the alewife run had fallen off a cliff, dropping from 250,000 in the 1960s to just 80,000 in the 2000s. In 2010, CFE/Save the Sound received a federal ARRA grant and partnered with CT DEEP, NOAA, NRCS, USFWS, Fish America Foundation, and RAE to set about remedying these problems. 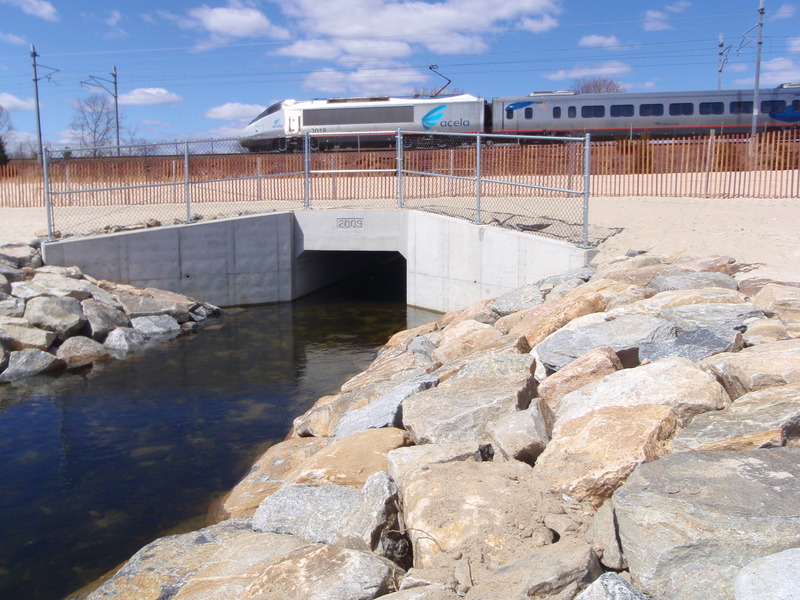 We removed the clogged and collapsing metal culverts and replaced them with a larger, shorter concrete box culvert. Ultimately, this work restored and enhanced five river miles, five dune acres, 72 lake acres, and 81 marsh acres of habitat. Restoring active tidal flow to the marsh not only improved water quality and plant health, but also provided support for migratory and resident bird populations. A healthier environment has increased tourism and recreational activities for park visitors. And most importantly, the alewife run has drastically improved—more than doubling in the first year following the project. 2013 was a record year, with nearly five times more fish heading through the culvert to spawn in Bride Lake. Since the project, the alewife run has nearly returned to its 1960s average. There’s no argument—2015 was an especially harsh winter. Record snowfall combined with a late start to spring has significantly affected migratory fish movements in Long Island Sound and the region as a whole. 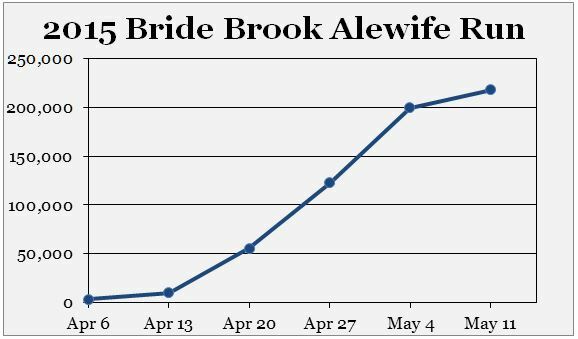 Bride Brook alewives were almost a full month behind schedule. By the first week of April, only 3,000 alewives had arrived. Alewives were spotted in the Connecticut River several days later, about two weeks later than usual. While river and inshore water temperatures sat around 40°F, the fish seemed to be keeping their distance. During the latter half of April, water temperatures rose but the rivers were still high from the spring melt. As shad began entering the Connecticut River, the alewife count really picked up, hitting 122,000 by the end of the month. Breaking 100,000 is a significant milestone for Bride Brook. Prior to restoration, the average alewife run sat around 80,000. Even at that level, it was still considered one of the best runs in Connecticut, which just shows how far the population had fallen over the last 50 or 60 years. Now we hit 100,000 with several weeks left in the season! Spring finally arrived as the calendar turned to May. Air temperatures surpassed the upper 60s, water temperatures increased, and river levels dropped. Alewife increased across the state, including Bride Brook, which jumped to 200,000 thanks to its largest weekly gain—over 75,000 fish. That provided enough fish to relocate some to alewife restoration projects in other areas. A big warm spring rain would have really helped create an even more inviting spawning environment! The alewife run at Bride Brook ended this week, with a final tally near 220,000. While some may continue to enter, the great majority will be leaving soon so CT DEEP has removed its counter. Alewives will continue to arrive in the western Sound, especially at Mianus River in Greenwich, another one of the best runs in Connecticut. A significant determining factor in a run’s quality is weather. As we witnessed this year, a winter with heavy snowfalls and lingering cold temperatures can be an enormous suppressant on migratory fish, not just alewives. Alewife spawning is also cyclical by nature. Alewives spend three to five years out in Long Island Sound and the Atlantic Ocean before returning to spawn. We are hopeful the 2016 and 2017 runs will be strong, corresponding with the return of adults from 2013’s record run. Post-restoration, alewife spawning at Bride Brook now averages about a quarter million fish annually, a tremendous increase from just a decade ago. This means more forage fish to help sustain and support recovering stocks of the Sound’s most popular species such as stripers and bluefish. Management of migrating forage fish still needs an upgrade to protect our growing stocks. We advocate ecosystem-based policy throughout their range to account for their role as forage, while allowing commercial industries to thrive sustainably. 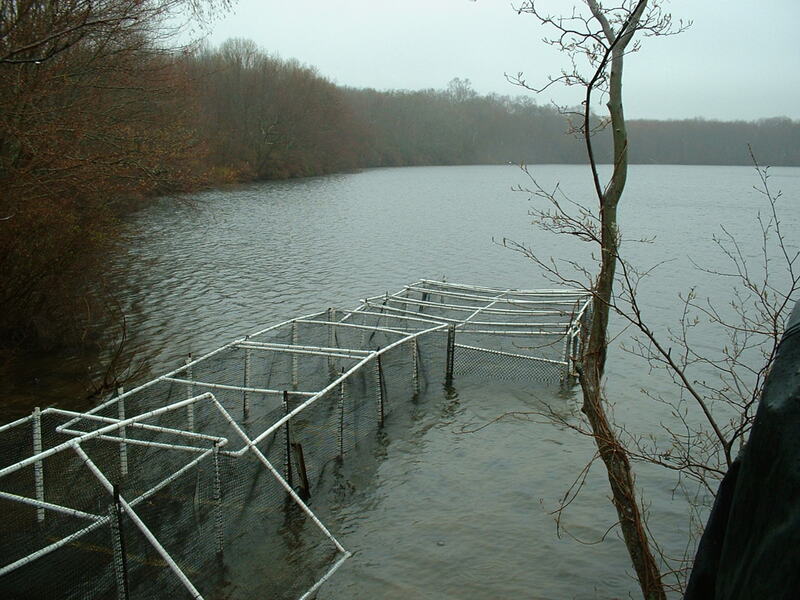 In Connecticut, we have erased dozens of barriers for spawning fish by removing dams or building fishways. And we are taking out two more dams this summer: Pond Lily in New Haven and Hyde Pond in Mystic. CFE/Save the Sound and our wonderful partners cannot do this work alone, and need your support to continue enabling thriving and growing stocks of forage and game fish in our rivers and Long Island Sound. Financial support and volunteer efforts can go a long way. Thank you! This blog builds on CT DEEP’s weekly diadromous fish reports. Check out these reports every week and more great information about Connecticut’s migratory fish at www.ctriversalmon.org.